With spectacular views across the South facing gardens, The Lodge offers 1,100 sq ft (NIA) of office space over two floors. Able to accommodate up to 10 people, The Lodge benefits from private car parking spaces and close proximity to Bowcliffe Hall and the beautifully maintained gardens on the Estate. 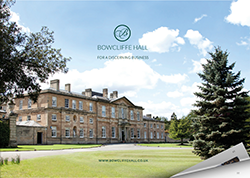 Anyone taking an office on the Estate is entitled to free membership of our private members’ club, the Bowcliffe Drivers’ Club, located in Bowcliffe Hall. With décor inspired by the glamorous 1920s and the Golden Age of Motoring, our award winning Signature Chef, John Topham, creates delicious breakfast & lunch menus and all day refreshments, making the Drivers’ Club the perfect location for informal meetings or simply taking a break from the office. Fill in the form below to enquire about The Lodge. We’ll get right back to you. If you’d prefer a chat, call us on 01937 541111.